These prophetic words are among the last five-year-old Imaro hears from his shunned mother, Katisa, as she leaves him with her people, the Ilyssai, who are reluctant to accept him. The reason; Imaro was conceived outside of the clan soon after his mother had avoided a forced marriage to the clan’s sorcerer. Though a warrior in Katisa’s eyes, her young son is faced with the perilous and turbulent journey of proving himself as such to the Ilyssai who alienate him and refer to him as ‘son-of-no-father.’ It is a journey that begins as he watches his mother exile herself from the clan, and his life, forever. In exchange, the Ilyssai grants Imaro the chance to earn his place among them. Years elapse and as Imaro grows into manhood he displays remarkable strength, endurance and tenacity that are admired by some and envied by others. His path is lined with backstabbers who seek to either rob him of any chance of glory, or simply boost their own. Due to trust issues, Imaro is understandably slow to make friends, but makes fast enemies. Through it all, his keen intuition alerts him to an almost palpable presence of dark mystical forces that follow him like a predator, studding his path with unrest and peril, but why? A series of events leave Imaro determined to receive answers, poised for confrontation…and hungry for revenge. IMARO, the first in a series, has been compared to Conan and I guess I can see the reason behind the comparison since both contain similar elements prevalent in sword & sorcery fiction, but Imaro is truly an adventure all its own. Charles Saunders has crafted a rich, classic tale that crackles with imagination. The scenery and descriptions are vividly described, but not excessively so—something I’ll keep in mind when penning my future work. Also, his adrenaline-inducing action sequences kept me glued to the pages. I found Imaro relatable in that he’s doing his best to survive a situation he didn’t choose for himself. At some point or another we all find ourselves in a position of either being an outcast or having to prove ourselves to our peers. Imaro’s story is one that will resonate with anyone who has ever been an outsider at one point or another. He demonstrates that though difficult, being an outcast is survivable and in some cases preferable as he attempts to shape his own destiny. Imaro is as capable as he is strong, but he, too, has flaws and makes decisions that jeopardize those around him, particularly the few he comes to know as friends. Originally written in 1981 (long before I realized my own desire to write) and revised in 2006, IMARO is the culmination of Mr. Saunders’ dedication, passion, patience and enthusiasm. These attributes are clearly reflected in the immense quality of his work. Initially, I was somewhat intimidated by the sporadic inclusion of the Swahili language, but the handy glossary Mr. Saunders included in the back of the book—and the immersive method in which he introduces the reader this rich lingo—makes for a comfortable transition. As a result, I was rewarded with not only an engaging story and a few sleepless nights due to my piqued interest, but also increased knowledge of the fascinating lives, languages and customs the tribes mentioned in the tale. Imaro is an extraordinarily well-written novel that every fantasy enthusiast, particularly those of sword & sorcery, should add to their collection. I look forward to continuing Imaro’s journey and reading more of Mr. Saunder’s work. 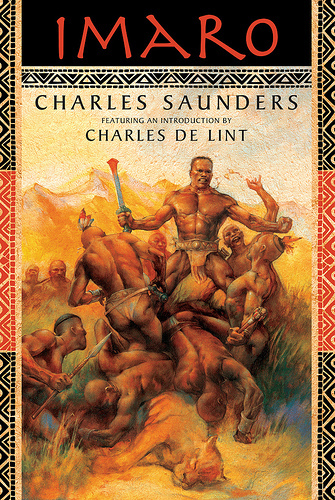 This entry was posted in Reviews, Uncategorized and tagged action, Adventure, Africa, Book Review, books, Charles Saunders, Conan, dark forces, Fantasy, fiction, hero, Imaro, magic, Sword & Sorcery, Warrior. Bookmark the permalink.